For Fossil Outlet Locations, bags, watches, accessories, Ladies Designer Shoes, and other wholesale factory outlet items all over America, scroll down to the links below for detailed lists. Discount factory outlets across America carry all types of quality items. Purchase apparel, footwear, accessories, electronics, sporting goods, music, toys, gourmet foods, furniture, bedding, and more at all your favorite factory outlets. Items from factory outlet stores are a lot less expensive than they are at retailers, and are usually sold at wholesale prices. Outlet store inventory includes overstocks, close outs, and other surplus merchandise. All items found at factory outlets are new, undamaged items in their original packaging. This page features a detailed list of factory outlet malls in the state of New York. The state of New York is home to at least 16 factory outlet malls, featuring hundreds of stores selling all your favorite designer brands. Fossil Stores are so plentiful that there are nine Fossil Outlets with 100 miles of New York City. Here is a list of factory outlet malls in the state of New York. Adirondack Outlet Mall, located in Lake George, near Albany, features 11 factory outlet stores to shop through. For store hours, driving directions and other info, call ﻿(518) 793-2161. Chautauqua Mall in Lakewood has 38 factory outlet stores to choose from. For a mall map and more info, visit their website. Or call 716-763-9355. Destiny USA in Syracuse has 14 factory outlet stores to explore. For driving directions and other details, call 315-466-6000. 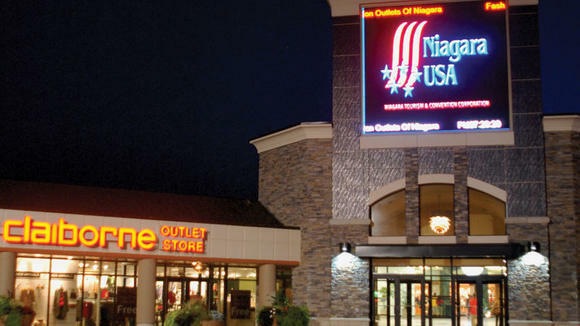 Fashion Outlets of Niagara Falls has 86 factory outlet stores, including a Fossil Outlet. For driving directions and other details, call 716-297-2022. French Mountain Commons in Lake George, near Albany, has 1 factory outlet store - J.Crew. Call 518-792-1483 for details. Harden Factory Outlet in McConnellsville (near Syracuse) also has 1 factory outlet store - Harden. Call 315-245-1000 for details.